Hydrangeas [hy-DRAIN-gee-ahs] are deciduous shrubs, highly valued for their abundant dark-green foliage and their large flower clusters. Probably the most popular hydrangea shrubs are those called Bigleaf Hydrangeas. Bigleaf hydrangeas vary in height from 5 to 10 feet tall and will be about 10 feet wide when fully mature. As their name suggests, bigleaf hydrangea leaves are large, about 4 to 8 inches long and 4 to 6 inches wide as you can see in the photo. Bigleaf hydrangeas flower from summer to autumn, after their leaves have emerged. 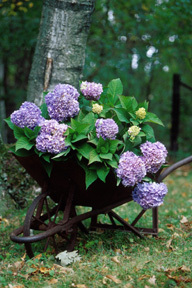 Flowers of the mophead hydrangeas are large, round balls, often 4 to 10 inches across, composed of many small florets. Hydrangea flowers are borne at the ends of the current year's shoots and are either white or colored shades of blue or red depending on the type of soil you have.